If you earned a pension while working in private industry, you probably also paid Social Security taxes on your earnings. If that’s the case, the two retirement income streams are independent of each other, and you can enjoy the full benefits of both. However, if you earned a pension while NOT paying into Social Security (“noncovered employment”) but are eligible for Social Security benefits through other employment or a spouse’s employment, two provisions might reduce your benefits: the Windfall Elimination Provision (WEP) and the Government Pension Offset (GPO). Both of these provisions are intended to adjust for a perceived unfair advantage when Social Security benefit formulas are applied to those who also earned pensions in noncovered employment. 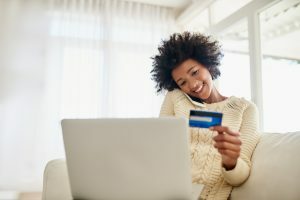 The Social Security Administration estimated that about 3.5% of households were affected as of 2014, and the benefit reductions can be substantial. Federal workers hired after December 31, 1983, are generally not affected by either provision because they paid into Social Security. However, public-sector employees in some states, employees of nonprofit organizations, and workers in foreign countries could be subject to the WEP regardless of hire date. The GPO only affects workers who earned pensions in noncovered federal, state, or local government employment. 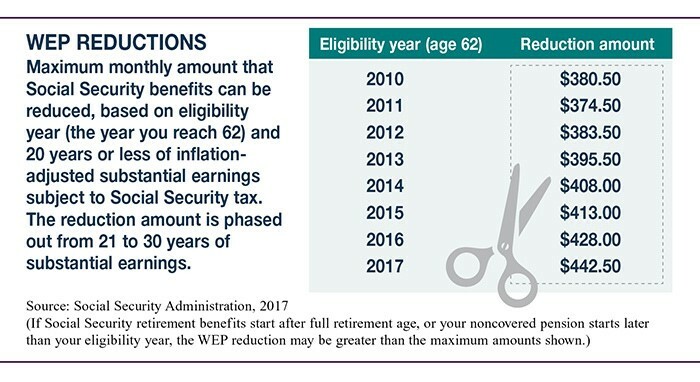 The amount of the WEP benefit reduction depends on the year you turn 62 (eligibility year) and the number of years in which you had “substantial earnings” and paid into Social Security, with the maximum reduction potentially applying for those who paid Social Security taxes for 20 years or less (see table). 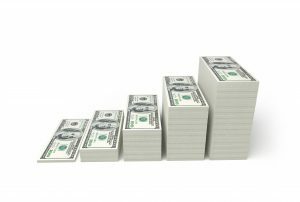 The reduction cannot be more than one-half of your pension from noncovered employment. Because the WEP reduces your Social Security Primary Insurance Amount (PIA), spousal and dependent benefits based on the PIA may also be reduced. The WEP does not affect survivor benefits. The GPO may affect spousal or survivor benefits if the spouse or survivor earned a government pension without paying into Social Security. In this case, the GPO may reduce Social Security benefits up to two-thirds of the amount of the pension. For example, if you receive a $900 monthly government pension from noncovered employment and are eligible for a $1,000 monthly Social Security spousal benefit, you would receive only $400 per month from Social Security [$1,000 – $600 (2/3 x $900) = $400]. You would still receive your $900 pension, so your combined benefit would be $1,300. Rules and calculations for the WEP and the GPO are complex. For additional information, including calculators to estimate the potential reduction, see ssa.gov/planners/retire/wep.html and ssa.gov/planners/retire/gpo.html.